Are you facing this windows modules installer worker high disk usage issue then you can do this get a relief from windows modules installer worker.When your Laptop freezes suddenly and you opened task manager if you observe something like windows modules installer worker high disk usage, this means windows may be updating a particular program or working on a installing taking most of the CPU cycles. Have your ever faced a laptop sudden restart on your windows OS either it may be windows 8 or windows 10. 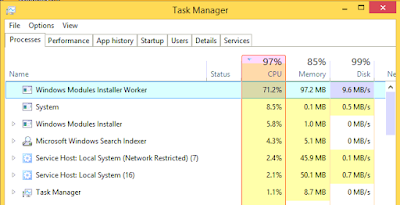 In Windows 8 or 8.1,10 laptop whatever it may be,there may be situations sometimes your Laptop CPU fan which is to cool your laptop suddenly runs very fast and make noise do you know the reason this is probably because Windows Module Installer Worker occupies CPU more than 50% so making it hard for the cpu handle all other tasks. In this case, one who is facing this problem can solve the Windows Module Installer Worker problem by changing windows update into manual mode. How to solve or troubleshoot "Windows module installer"? Confused how to take into update into manual mode? Now search this term "Windows module installer". now you should Double click on the "Windows module installer", and make it in to manual option . It is usually set Automatic. Now Double click on the "Windows update", and make it manual. Open Control panel and then Click "Windows update" then you can see Change settings there. Change the setting into "Check for updates but let me choose whether to download and install them". It is usually set automatic. So its done now The Windows module installer workers cannot bother you anymore. This is how you can solve "Windows module installer". and do you know how Android 360 degree camera works? So you need to remember one important thing here the options here are set from automatic to manual so there wont be any updates for you from windows so you need to monitor about the new updates from the windows so check for updates weekly or monthly. This is how you can extend your Android Battery Life.